$25 per day ($50 total) Range Fee will be collected at the beginning of the class by the range staff. Don’t have night vision, but still want to train? No problem. We offer rental NVG’s, Helmets, Mounts, and Lasers for an additional fee. If you decide that you want to purchase the gear you rented during the class, your rental fee will go towards the purchase of the new product. 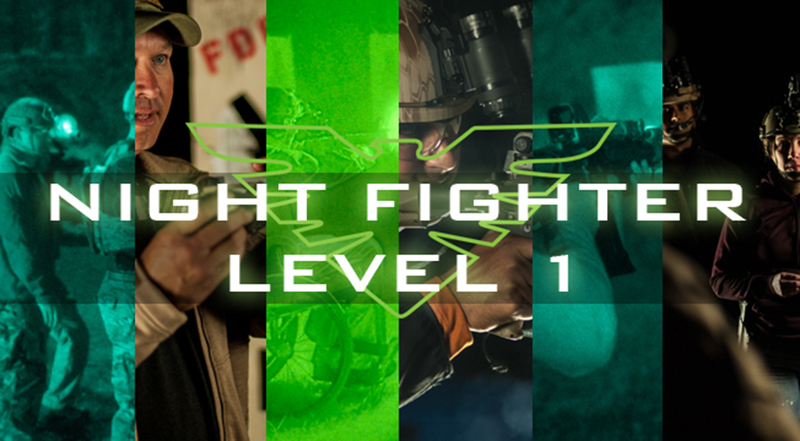 Night Fighter 101 is designed to arm students with a solid understanding of the fundamentals of night vision operation and use. Beginning with gear choice and setup, the class provides students the tools for learning to safely / effectively move, shoot, and communicate in low-light/no-light environments. Students will participate in a variety of movement, stalking, and live-fire exercises aimed at producing a core competency with night vision goggles, lasers, and white light. We have a limited fleet of rental gear available for students who do not already own night vision. For an additional fee, you can rent a package that includes a TNVC TNV/PVS-14 Gen3 Night Vision Goggle, Steiner DBAL IR Laser, Ops-Core Bump Helmet, and Wilcox L4 G11 Mount. Rental Gear is first-come/first-serve. Export of Night Vision Equipment or related accessories (such as manuals) is strictly regulated by the US Department of State in accordance with the guidelines of the International Traffic in Arms Regulations (ITAR). It is a major crime to ship or carry US manufactured night vision devices outside the borders of the United States, punishable by fines and prison sentences. Ignorance of these regulations will not hold up in court. By purchasing night vision equipment from TNVC, you attest that you will not attempt to export or carry this night vision equipment outside the borders of the United States. Also, it illegal to allow a non-US Citizen to look through US Gen3 Night Vision Devices, even on US soil. Again, this is a crime punishable by fines and prison sentences.